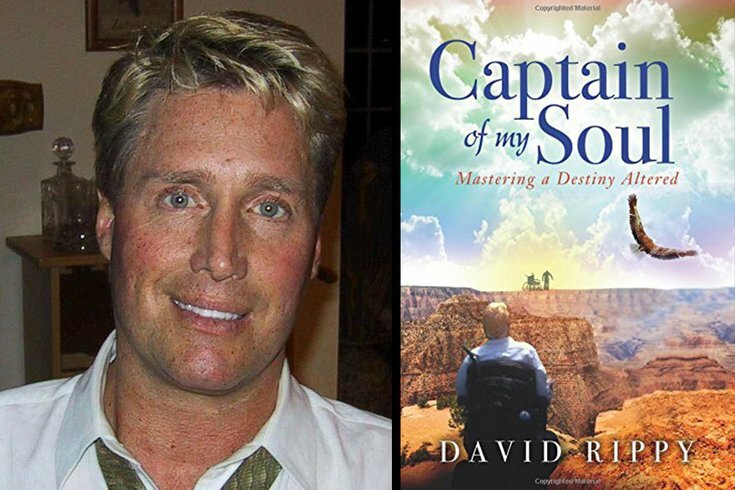 David Rippy wrote “Captain of my Soul" after he was paralyzed from the shoulders down in a car accident. “Some see what happened as an unlucky roll, snake eyes," he says. "I saw it as ‘Hey, now’s my chance that I didn’t have before to see what I’m made of.’ "
The story he wanted to tell was several decades in the making, so it’s easy to see why David Rippy took two-and-a-half years to compose his memoir. That it centered on the impact that a one-car crash which left him paralyzed from the shoulders down had on his life – both for good and for bad – makes that accomplishment amazing, though. That finding-good-in-the-bad spirit shined through when PhillyVoice met up with Rippy at his Exton, Chester County condo to talk about the inspirational message behind his book. It was quietly released several months ago, but he’s just shifted into the get-the-word-out phase. While the paperback isn’t in mass circulation – he estimates about 1,000 copies were printed – Rippy hopes the “memoir on tragedy, disability and overcoming the odds” finds its way to those facing similar obstacles he’s faced since the day his life changed forever as a 25-year-old. Speaking at rehabilitation hospitals and schools is one way to make that happen. Getting a copy into the hands of Ellen DeGeneres or another talk-show host with a substantially wider audience would bring about quite a bump, too, he said. “I hope it’s relevant to 8-year-olds and 80-year-olds,” he said in a home densely decorated with global artifacts ranging from rare stones, a sword collection and a print of Michelangelo’s “The Creation of Adam” painting. He was a 25-year-old who attended Villanova University, graduated from Texas A&M University with a degree in economics and was embarking on a career at a Fortune 50 company. After a night out with friends, he was a passenger in a vehicle cruising along a “silent and desolate” stretch of Route 1 in Delaware County. The car struck a deer, veered off the road and crashed into a tree. The driver emerged relatively unscathed. Rippy did not, and the book goes into painful detail of what happened at the hospital and beyond. He’s been confined to a wheelchair “for more than 15 years,” he said. With chapter titles like “Finding Acceptance & Personal Reflections,” “Learning to Adapt & Finding Patience and Peace” and “Keeping the Faith,” Rippy set out to highlight how he was able to move on with a successful life rather than wallow in woe-is-me despair. He also relied upon – and included – quotes like Confucius’ “it does not matter how slowly you go as long as you do not stop” in the book to bolster his message. “(This can relate to) every person’s journey who suffered trauma,” he said. “I was looking to find something to focus on (after the accident), and setting goals is what I did. As he adapted to life as a quadriplegic, he set out to meet his “ambition to become a money manager” and got back to work at Merrill Lynch and Vanguard Group. It hasn’t been an easy path, though, albeit one made easier by discovering the benefits of meditation. “Meditation helps you see things in a broader way, from more perspectives than we give ourselves credit for. It’s all about slowing the mind down and controlling the mind chatter,” he said. When it came to writing his book, the driver from the night of the accident served as his editor. They’ve remained friends in the years since. Rippy plans a second book – “A Practical Guide to Survive and Thrive with Disability and Disease” – which he hopes to release in May 2018. Though he doesn't dwell on negatives over the course of an hour-long conversation, he noted that public-place accessibility for people in his situation is a continual challenge. Asked how he thinks the journey has changed him, Rippy said he doesn’t think it has to any large degree. Sure, he misses water skiing and the ability to go into a store a shop by himself, but he doesn’t dwell on it. In fact, as he shows off the RT300 restorative therapy bike – with arm swings and electrodes that jolt his muscles – he talks optimistically about a future that he thinks will be his.